We often have to take a long view to see change happen and, after decades of work, we’re seeing a surge in sustainable investing and corporate buy-in. 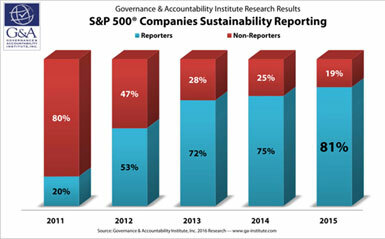 Almost all S&P 500 corporations produce annual Sustainability Reports that evaluate their progress on social and environmental dimensions. Last year, 81% of S&P companies published reports, up from 20% in 2011! Pressured by activist investors for decades, it took until 2011 to really gain acceptance. 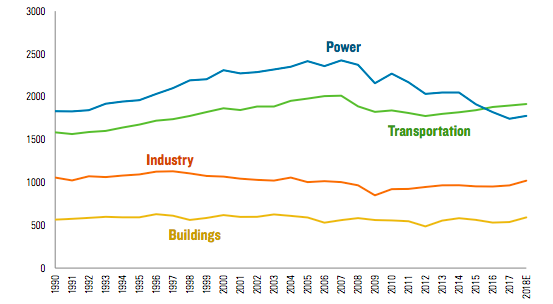 In 2012, 53% produced reports, rising to 75% in 2014, according to Governance & Accountability Institute. Worldwide, 95% of the 250 largest companies produce these reports. Now that there’s a critical mass of interest, the finance sector is jumping in to help investors evaluate stocks and mutual funds based on environmental and social factors (ESG). Anyone can make use of Morningstar’s scores. The new Morningstar Sustainability RatingTM compares mutual funds and ETFs on how well companies held in their funds perform on ESG criteria. About 20,000 funds around the world are rated so far. 10% of them received the highest rating, most of which are pioneers in socially responsible investing, such as Calvert, Green Century and Parnassus. "JP Morgan Ethos Investments" is a web-based platform that helps investors evaluate and choose companies based on environmental, social and governance (ESG) criteria. They can compare stocks, mutual funds and Exchange Traded Funds (ETFs), and even green bonds. "We have seen first-hand the rapid rise in demand for ESG based products, as clients realize returns can be just as rewarding as with traditional products," says Tim Throsby, Global Head of Equities for JP Morgan. "We expect it to open up a whole new investment base for companies that demonstrate strong ESG credentials, and bring opportunities for investors." New indexes will be added, such as the S&P Europe 350 Climate Change LVHD Index, which launches soon. A new ETF, Etho (NYSEARCA), consists of the 400 most climate-efficient companies, such as Apple, First Solar, Google, Intel, Nordstom, Chipotle and Tesla. The Clean Capitalist Decarbonizer shows the financial implications of divesting from high carbon companies in favor of those that derive at least 20% of revenue from environmental markets. It includes 7000 securities – more than 85% of global market capitalization, says Corporate Knights and South Pole Group. 75% of investment managers say they choose ESG products now, according to a survey by Tiburon Strategic Advisors. Investments are up 37% from eight years ago, growing to $3.8 trillion in assets. Calvert still dominates the field with $13 billion in assets, followed by JPMorgan Chase with $9 billion. And while many of these likely wouldn’t meet our strict criteria, about 4200 financial services firms and 420 mutual funds say they offer ESG investments. Still Wonder if Environmental/ Social Leaders Perform Better? Over the past 20 years or so, big investors continually questioned whether they could get the same or better performance by putting their money in "good" companies. They questioned it even though study after study showed companies that lead on ESG outperform financially. Now, the largest meta analysis ever, confirms that. After evaluating 2200 studies published since the 1970s, researchers conclude that investments based on ESG criteria "pay off financially and are stable over time." Each year, activist investors file shareholder resolutions with companies to influence change on key areas, such as addressing climate change. Mutual fund managers vote on these resolutions for companies in their funds and typically either abstain or vote with corporate management. Among 42 mutual fund families analyzed in a recent study, nine of the biggest failed to support even one of 73 climate resolutions last year: Vanguard, Fidelity, Blackrock, American Funds, American Century, ING (Voya), Lord Abbett, Pioneer and Putnam. Seven supported 70% of climate resolutions: AllianceBernstein, Allianz, Deutsche, GMO, Oppenheimer, Schroder and WellsFargo, according to Fund Votes. Read our article, Shareholders Target Big Bank’s Financing of Coal. California Public Employees’ Retirement System (CalPERS) – the largest pension fund in the US with $288 billion in assets – pioneered activist investing. Now, it’s taking another step by requiring the corporations it invests in to include climate change experts on boards. "Updating our requirements ensures that corporate boards have the expertise and competence to adequately understand and address the challenges and risks imposed by climate change," explains Betty Yee, California Controller. New York State Common Retirement Fund – the third largest pension fund – wants ExxonMobil to produce annual reports on how it impacts policies on climate change. These large funds have so far resisted divesting from fossil fuels, because they want to influence corporate behavior as shareholders. Standard & Poor’s now includes environmental risks as part of evaluating state and local governments’ credit ratings. France is the first country to require that investors and banks disclose how they are managing climate change, in addition to all companies on the stock exchange. Institutional investors, such as pension funds and insurance companies, must report on the environmental impacts of their investments. About 50 investors voluntarily signed on to the Montréal Pledge, which commits them to measure and publicly disclose the carbon footprint of their portfolios each year. Read our articles, At Rio+20, Cities & Stock Exchanges Take On Climate Change and Most Companies Ignore SEC Climate Reporting Requirement.